The 16-metric ton HX160L excavator from Hyundai Construction Equipment Americas features new technologies that make the operating experience more comfortable, more ergonomic and more user-friendly. Hyundai Construction Equipment Americas today announced at the BAUMA 2016 international construction expo the addition of two new models to its HX Series of Tier 4 Final-compliant hydraulic excavators – the HX160L and HX180L. At 16 metric tons and 18 metric tons, these two machines meet the needs of customers in two of the most popular size classes for crawler excavators. They join a family of nine other HX excavators Hyundai began introducing in 2015 to U.S. and Canadian markets. Like other models in the HX product line, the new Hyundai HX160L and HX180L excavators provide up to 10-percent better fuel economy and 5-percent increased productivity compared with previous models. Both the HX160L and HX180L are powered by Perkins 1204E Tier 4 Final engines rated at 128 net hp (96 kW). The HX160L excavator is rated as a 16-metric ton model, with an operating weight of 40,680 lb (18 450 kg). 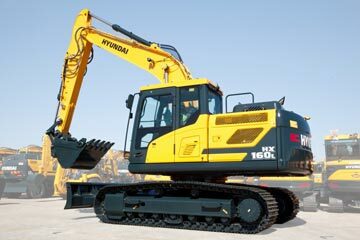 The 18-metric ton-rated Hyundai HX180L excavator has an operating weight of 42,882 lb (19 450 kg). “The standard, high-end features of the new Hyundai HX160L and HX180L excavators are designed to meet and exceed the needs of contractors looking for the best available combination of performance, reliability, control and comfort,” said Corey Rogers, marketing manager, Hyundai Construction Equipment Americas. The operator’s cab in each new HX excavator model includes as standard equipment an 8-inch (20.3-cm) interactive, adjustable, touchscreen cluster-monitor with haptic remote control, providing easier operator accessibility and better ergonomics. The haptic remote control delivers reactive, tactile sensations using vibrations and pulses to guide the operator through menu selections. Viewable on the monitor is the Hyundai-exclusive AAVM – or All-Around View Monitoring – an optional system that provides a 360°-surround virtual operating view. Included in AAVM is the IMOD (Intelligent Moving Object Detection) system that senses and warns the operator when objects come within 16.5 feet (5 m) of the machine. The AAVM system helps make the Hyundai HX series among the safest excavators to operate on any jobsite in North America. The cab on the HX160L and HX180L excavators is 13-percent roomier that prior models and features enhanced climate-control, more leg and foot space from the seat to the pedals, reduced in-cab sound level, heated operator’s seat with standard air suspension and integrated console. Additional features include a Bluetooth audio system and Miracast wireless functionality for viewing a mobile device screen on the monitor. Hydraulic system enhancements on the HX160L and HX180L excavators include an innovative Boom Float mode for better grading control, Fine Swing mode for improved load control when swinging, and up to 13-percent faster cycle speeds than previous models. Both models also feature IPC (Intelligent Power Control) computer-aided power optimization based on load demand, and Eco Breaker mode for selectable pump flow and improved fuel consumption when working with Hyundai hydraulic breakers and many other attachments. The combination of faster cycle times and more power results in productivity increases of up to 5 percent. Enhanced reliability features on the HX series include reinforced longer-life pins and bushings coupled with wear-resistant polymer shims and newly designed cab shock mounts with dual shock absorption for reduced vibration and noise and improved operator comfort. Serviceability enhancements include ground-level access to the fuel filter and convenient exterior access to the cab air filter. Additional guard rails provide greater safety while performing maintenance and inspections on the upper structure deck. New Tier 4 Final engine technologies, a more efficient vertically stacked cooling design, efficient electronic fan clutch, and hydraulic system innovations on the Hyundai HX series excavators contribute to an overall fuel efficiency improvement of up to 10 percent compared with previous models. The Hyundai HX160L and HX180L excavators are protected by Hyundai’s industry-leading three-year, 3,000-hour standard warranty and five-year, 5,000-hour structural warranty. Hyundai also includes three years of free access to its Hi-Mate remote management system which provides a variety of remote monitoring and diagnostic services.